Wanted to pop up this photo because I thought that it came out rather well, considering it was taken on an iPhone. Thank goodness for Instagram, which makes every picture look about seventy times better than the original! And so much easier than having to fiddle about with the exposure and the contrast and all of those other bits and pieces that you have to do with “proper” photography. Mind you, I have to do that with all of my videos, which takes a lot longer, so…sigh. 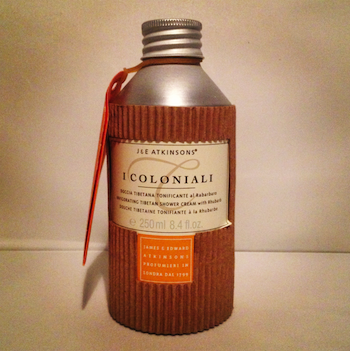 This lovely bottle of shower cream is by I Coloniali, step-brother of I, Claudius. (Boom-boom.) Once the outer cardboard sleeve is removed, it’s quite a masculine bottle, and I think that the fragrance is quite manly too. At any rate, Mr AMR seems to have moved it gradually towards his “part of the shelf”, so I’m guessing it’s a hit. October Beauty: What Really Worked?